Police car chases are inevitable. In fact, I can almost guarantee that some jerk out there in the world has decided to outrun a police car right this very moment. And oftentimes, the pursuit ends up ugly, with either the culprit or the police cruiser ending up in a mess – unless the police car is a Ferrari 458 Spider or a Dodge Charger Hellcat then that chase will end up differently. An example of such grisly police car chase scene was this one in Florida. 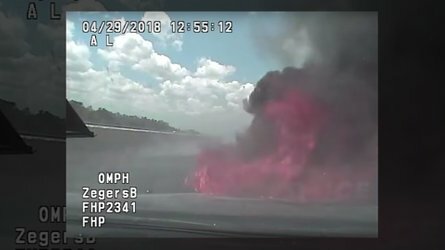 A cruiser tried to catch a speeding SUV on the freeway but ends up having to use a fire extinguisher to put out the fiery mess that his car has gotten into. According to a report by a local NBC station, the car chase happened back in Spring (which explains the date stamp on the video). The cruiser was part of the Florida Highway Patrol group and in this particular scenario, the cop spotted a vehicle speeding on the opposing traffic. He then made a U-turn on the median and chase the speeder, weaving in and out of the freeway traffic. The chase was a bit shortlived, and the on-board dashcam saw a speed of 142 miles per hour before the policeman apprehended the culprit onto a halt, which appeared to be a previous-gen Toyota RAV4. It would have been a win-win scenario – no one was hurt and it didn’t end in a crash. However, the cruiser started to expel smoke from the bonnet and ultimately, ended up in flames. The police officer tried to put out the fire using his onboard fire extinguisher but to no avail. The NBC report said that the Florida Fire Department responded to the incident. It wasn’t clear why the police car suddenly started to burn. It might be because the engine was so hot due to the high-speed chase and both cars pulled over the highway’s median, which was covered in dry grass. What could have happened next was just plain Physics.